As some of you know, I have a part-time gig at Canobie Lake Park. I was pulling trash cans in front of the coaster yesterday morning and noticed something new. Apparently, the ACEers had decided to make my beloved Yankee Cannonball a coaster landmark. This struck me as odd beause, at least in my mind, thereJs not much about it that screams "LANDMARK" besides the first thing you see when you pull through the gates. It wasn't the first of its kind like Magnum or X, nor is it all that origional like the Cyclone. Why did ACE choose it? Please enlighten me. Could it possibly be because of the "Frank Lloyd Wright"-Style Station? That wouldn't be it. The station on the Cannonball is a very similar look to the Canobie Corkscrew (an 80's vintage arrow). The only other thing is that because it was an H.P. Schmeck design, simiar to Blue Streak. I thought landmark status meant original restraint and brake styles. And why wouldn't being a Herb Schmeck ride be a big deal to you? Just like John Miller designs, there aren't many Schmecks left. I haven't been an ACE member for a while, but they had a designation called ACE Coaster Classic, I think, that was awarded to rides that continue to run as it did originally, with the same restraints, brake, station configuration, operating procedures, etc. They are typically old, wooden coasters and are hard to come by especially these days. When Cedar Point's Blue Streak was drastically altered it might've been for a variety of good reasons, but it's Coaster Classic status got pulled. Coaster Landmark may be something else, and I've seen plaques at various coasters that wouldn't necessarily qualify as a classic but are landmarks for other reasons. Something makes me think Magnum XL 200 is one of these landmarks, but more than likely due to its one time record shattering status. I'll be sure to look again next time I'm there. A visit to the ACE website might lead to answers, too. Edit to add: Oh, duh. Wasn't ACE just in New England for Coaster Con Whatever? If Canobie was a host park they might've bestowed the plaque on the park just last week. It's something they do to recognize and show appreciation for a host park with a notable coaster. Edit again to add: There, gamer guy has the answer. Never mind! Bye bye! 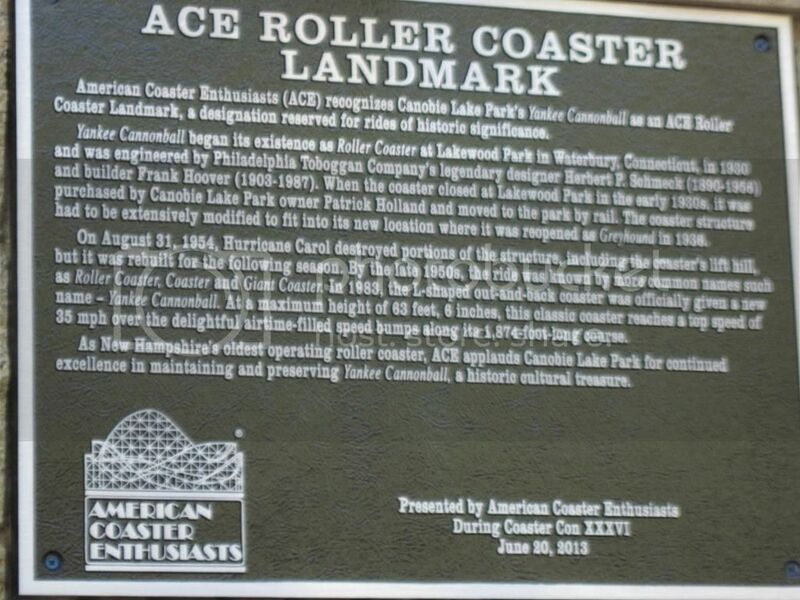 ^Yes ACE had the placque dedication on Thursday morning during Coaster Con, thats when i took the pic! Per the ACE website: "ACE recognizes historically significant roller coasters as Landmark Coasters. ACE typically designates a few additional coasters as Landmark Coasters each year as we strive to recognize more historically significant roller coasters." I'd guess that the Landmark designation was developed to allow ACE to honor coasters that do not fit the more stringent requirements for an ACE Coaster Classic designation. ...or get their plaques, logo and general self-promotion into more parks. The ACE guidelines are no longer relevant in today's litigious environment - there would be no more "plaque-able" coasters if they stuck to the original stringent requirements. CoasterBuzz is going to start handing out participation plaques to all coasters, to avoid damaging the self-esteem of others.